Over the course of eleven days, thousands of the film industry’s top professionals gathered in Park City, Utah for the prestigious 2018 Sundance Film Festival, which boasted a number of screenings and events where Oklahoma’s film and music industries were both widely represented and positively received. Oklahoma took center stage with the feature film “Wildlife”, the directorial debut of actor Paul Dano (“Little Miss Sunshine”), which celebrated its world premiere at the festival. The film, which utilized the Oklahoma Film Enhancement Rebate Program administered by the Oklahoma Film + Music Office (OF+MO), began production in Enid, Oklahoma on November 6, 2016, and created 298 in-state jobs over the 39 day shoot. During the Q&A session following the premiere, Dano mentioned the production’s experience and predominant filming in Oklahoma. The City of Enid set the scene for the bulk of the film’s production with additional filming in the communities of Wakita, Hennessey, Ponca City and areas throughout Osage County. Thus far, “Wildlife” has garnered positive reviews by many outlets, including one from The Hollywood Reporter, which notes filming on-location in Oklahoma and praises both Dano’s keen direction and robust performances from the film’s leading talent, which includes Jake Gyllenhaal (“Jarhead”), Carey Mulligan (“An Education”) and Ed Oxenbould (“Alexander and the Terrible, Horrible, No Good, Very Bad Day”). To promote Oklahoma’s film and music industries and in recognition of “Wildlife”, OF+MO partnered with the Association of Film Commissioners International (AFCI) Beyond Cinema to host its annual Oklahoma reception. Additional support for this event was provided by local Studio Oklahoma partners, including Dunlap Codding; the Garneau-Goulden Family Fund; Visit Enid; the Tulsa Office of Film, Music, Arts & Culture; the Bartlesville CVB; the Guthrie Chamber of Commerce; and the City of Guthrie. In addition to supporting OF+MO, the Tulsa Office of Film, Music, Arts & Culture held its inaugural Film Tulsa event in partnership with AFCI Beyond Cinema, which also featured performances from local musicians Travis Linville and Eric & Happie. A number of other projects and events at the festival had ties to Oklahoma, including “Hal”, a documentary about wildly talented director Hal Ashby (“Shampoo”, “Harold and Maude”) helmed by University of Oklahoma alumni Amy Scott who also attended the festival. Scott joined OF+MO Director Tava Maloy Sofsky alongside filmmaker Dori Rath (“Wildlife”), CPA Fred Siegal and Chief Executive of Film London and the British Film Commission Adrian Wootton for a panel discussion “STATE OF THE SLATE” presented by Entertainment Partners (EP) and AFCI. This panel discussion, currently available to stream online here, further promoted Oklahoma’s film incentive and highlighted the successful production of “Wildlife” in Oklahoma. 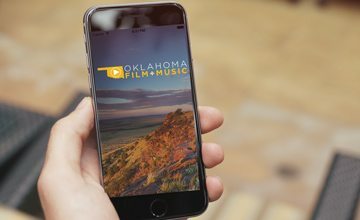 For more information on the Oklahoma Film + Music Office, including our rebate program and upcoming events, please visit okfilmmusic.org.